When every Chinese book has been catalogued digitally, and according to consistent standards, it will be much easier to take a global view of Chinese literature in the imperial period. At present, we must rely on what is printed, and in my view the most useful tools by far (and they appeared at much the same time) are Shanghai Library’s congshu index (中國叢書綜錄), which was first published in 1959, and the two printed catalogues of the Chinese collection in Kyoto University’s Institute for Research in Humanities. The first edition of the Kyoto catalogue (京都大學人文科學研究所漢籍分類目録) was published in 1963, and within it, the contents of congshu are classified; it thus corresponds with the second volume of the Shanghai work. But in the second edition (京都大學人文科學研究所漢籍目録), which appeared in 1979, the congshu contents are not classified; it thus corresponds with the first volume of the Shanghai work. These two monumental bibliographies give us what the computer screen never will: conspectus, and a three-dimensional view of their contents. Simply by counting the pages devoted to each subject in the classified volumes we can discover how much was written, and about what, and say with some certainty what interested traditional Chinese scholars. I have just looked at the “classics” division of each of them, and confirmed what has long been my impression, that the greatest number of individual works is to be found in the yijing 易經 section. This is not surprising in view of the primacy of that text, which has always come first in the traditional Chinese classification systems from the time that they were first devised, over two thousand years ago. A good example of the voluminous traditional scholarship in this area is an edition in the Backhouse collection which I first encountered in the late 1970s, and which has long fascinated me. It is a collectaneous work by the Ming dynasty scholar Yang Shiqiao (明)楊時喬, a jinshi 進士 of 1565 (嘉靖44), who as part of the conservative reaction to the ideas of Wang Yangming 王陽明 (1472–1529) sought to reaffirm the orthodox interpretation of the Yijing by the brothers Cheng Hao 程颢 (1032–1085) and Cheng Yi (1033–1107), and Zhu Xi 朱熹 (1130-1200). At much the same time as I was examining this edition, another example came to my notice, for sale in the catalogue of Tsi Ku Chai in Hong Kong. The contents of the Tsi Ku Chai copy were tantalisingly different, and as I had already decided to develop our pre-modern collections so as to demonstrate the nature and variety of Chinese book production during the last two dynasties (building on very considerable strengths), I bought it. The edition was published over a period of nine years in the 1590s, and not many complete copies survive. 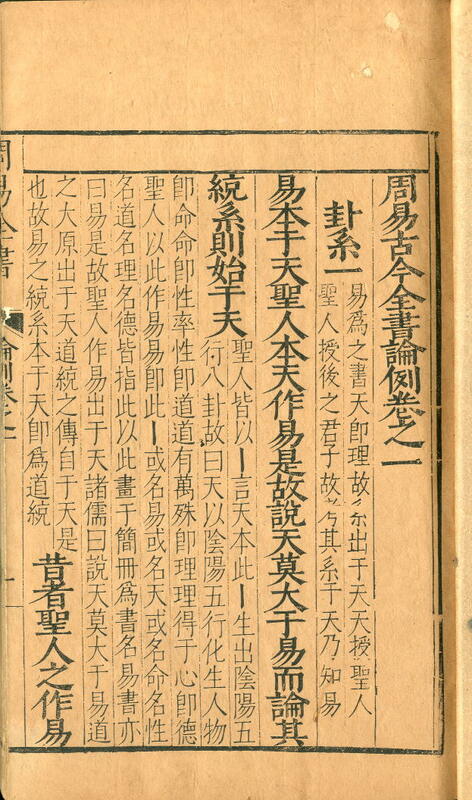 The reproduction in Siku quanshu cunmu congshu (四庫全書存目叢書, 經部8-9) has been pieced together from partial copies in Peking University Library, the Chinese Academy of Social Sciences Library, and the National Library of China. 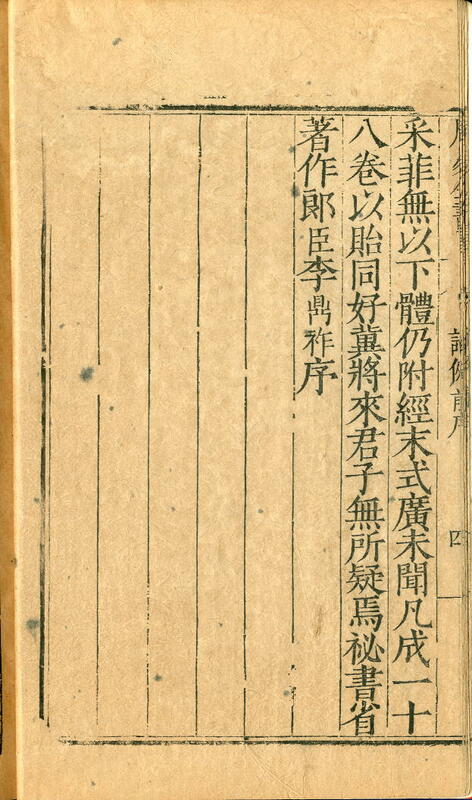 There is a complete copy in the Harvard-Yenching Library which has been described by Shen Jin 沈津 (美國哈佛大學哈佛燕京圖書館中文善本書志, 1999, 14-15). I will try to make some sense of this jumble of evidence. But for a number of reasons, I regard the work not as a single entity, but as a congshu. The titles within it were printed and circulated at different times, and indeed are often found individually in library collections. In his general preface, Yang says that he started to work on the contents in 1570 (隆慶庚午), and that they were to be known collectively as Zhouyi quanshu 周易全書. This is the collective title used in the general table of contents (illustrated above), and it also appears in the banxin 版心 of every single leaf. And most interestingly, the Backhouse copy, which I will presently describe in detail, shows that even if the work is to be taken as a single entity, the standard title (by convention taken from the first juan 卷) is in any case doctored. I also have a small quibble with Shen Jin’s description of the edition as having been made by Wang Qiyu 王其玉, one of Yang Shiqiao’s followers (門人). He does this on the basis of evidence found only in two later and relatively small sections of the work (傅易考2卷, 1595; 龜卜考1卷, 1599) – there is no evidence that Wang was responsible for the entire thing, although it is quite possible that he might have been. The Backhouse impression is very fine. As indicated above, the three sections present (論例二卷﹑古文二卷﹑易學啟蒙五卷) were all cut in 1592 – the rest followed three or more years later. In fact, the quality of the impression is so fine that we can reasonably infer that it was made soon after the blocks were cut, and that at the time of printing, the edition was complete (in a catalogue it would be incorrect to describe such a copy as incomplete simply because more blocks were cut subsequently). But one thing in particular confirms that the Backhouse copy is probably the earliest surviving impression of this edition. 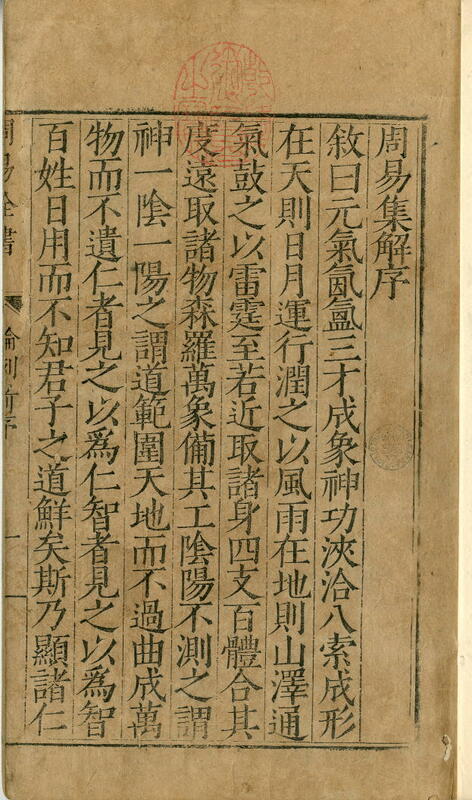 This is the title of the first work to be cut, which is 周易古今全書論例. In all the other copies, the title is 周易古今文全書論例 (that is, with the addition of the character wen 文). When we compare the Backhouse copy with the Sinica copy, it is clear that they are both from the same blocks, but that the characters 全書論例 in the former have been excised and replaced with 文全書論例 in the latter, as well as all other surviving copies. But as ever, when doctoring blocks, they never do it properly, so that in all the later impressions, the old title survives without the wen 文 at the end of juan 2. We can only guess why the character wen 文 was inserted. At first I thought it might have been done after the cutting of the jinwen 今文 section in 1596, to make it quite clear that the work is concerned specifically with the “old text” and “new text” versions of the Yijing, and not with the general history of the Yijing throughout the ages. However, the general preface also bears the longer title, and it is dated earlier than any of the other works in the set, perhaps being contemporary with the lunli 論例 section, which is the only work to have no preface of its own. The blocks of the Backhouse edition may well be an undoctored and unique survival, but the same cannot be said of the copy. Like so many books in Chinese collections, it has passed through the hands of a dealer who has tried to pass it off as something else. When I was first teaching myself about the tricks of this particular trade, I was puzzled by the preface, which is the Tang dynasty scholar Li Dingzuo’s 李鼎祚 preface to his commentary on the Yijing entitled Zhouyi jijie 周易集解. The preface has four leaves, but in the banxin of each are found the title of Yang’s work 周易全書 (I didn’t know that Yang had written his own prefaces to each of the sections until I bought the Tsi Ku Chai copy; they are in a more rounded calligraphic style than the text). 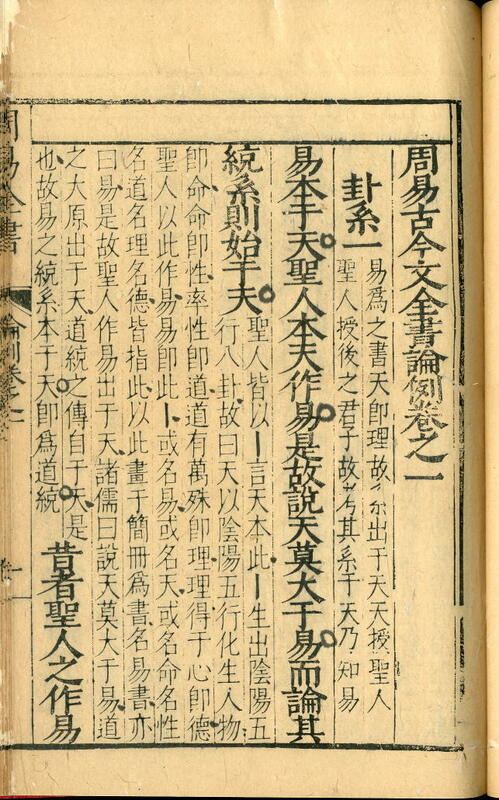 It is from the same blocks (but later, and possibly themselves doctored) as the copy in what is now the National Library of China, which is the very first work to be reproduced in the series 北京圖書館古籍珍本叢刊 (Peking, 1988). Taking a closer look at Li’s preface in Backhouse 276, we find that the banxin of all four pages has been carefully doctored. 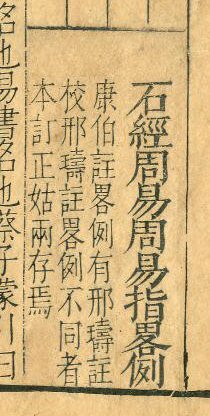 The words 「聚樂堂」 in the upper banxin 版心 have been excised from the leaves, and replaced with 「周易全書」, undoubtedly taken from leaves removed by the dealer (along with Yang’s dated prefaces) in an attempt to pass the copy off as something earlier. 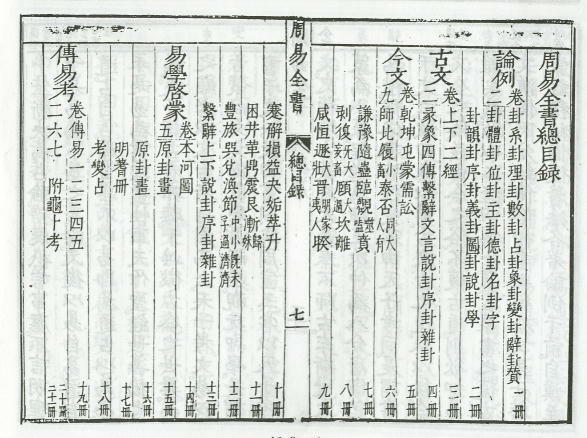 The detailed ascriptions at the beginning of the guwen 古文 section, which clearly identify Yang Shiqiao and other Ming dynasty personages involved in producing the book, have also been excised from the leaf in the Backhouse copy and replaced with something else (I don’t know where from) which might suggest an earlier date; they are present in the undoctored (but later) Sinica copy. 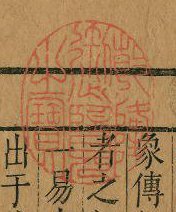 Gilding the lily, the dealer has also applied the seal 「乾隆御覽之寶」 (“imperially perused by Qianlong”) to the first leaf of each of the three sections, so that the first impression appears on the unrelated preface by Li Dingzuo that had been supplied to pass the book off as something earlier. It is inconceivable that the emperor would have examined such a copy, and the seal must clearly be considered a fake. This entry was posted on	11 February 2013 at 15:19	and is filed under Uncategorized.